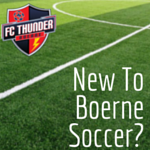 The required uniform kit is not part of the registration fee and each player must purchase a uniform kit separately from the Boerne Soccer Club (BSC), FC Thunder uniform supplier, Soccer.com. Recreational uniforms purchased anytime between Fall 2014 and Fall 2018 Recreational Seasons can be reused for the Spring 2019 Recreational Season. Order your uniform as soon as you have registered with FC Thunder. Backorder: Please note that in the event either of the Nike Park VI jerseys are on backorder, you can order the Nike Legend jersey in place of the Nike Park VI. Jersey sizing chart provided below product description on Soccer.com. Jerseys are customized with FC Thunder logo and no returns are accepted by Soccer.com for customized items. The cost of uniform items purchased are not refundable by BSC. Jerseys will not be numbered. The Recreational game schedule will designate a home team to wear the red jersey and an away team to wear the navy jersey for each game. U4-U10 Recreational players are required to wear black shorts and black socks for games. These may be any suitable black shorts and socks – i.e. from previous seasons, purchased from any clothing store, or purchased as optional equipment from Soccer.com (not required to be purchased from Soccer.com). Uniform kit must be purchased from Soccer.com before March 7, 2019 to ensure that the uniform arrives prior to Game 1 of the SPRING 2019 season. Uniform kit will be shipped by Soccer.com directly to the parent/player. BSC is in a 2-year uniform cycle that will began Fall 2018 season with Soccer.com. The U4 - U10 Recreational uniform kit is unchanged which means that your player may reuse a previously purchased uniform anytime between Fall 2014 and Fall 2018 Recreational Seasons can be reused for the Spring 2019 Recreational Season. Parents are required to provide the player’s shoes, shin guards, soccer ball, and drink for all practices and games (items available from Soccer.com or any other retail outlet). For practice the week prior, players are encouraged to wear opposite color jersey as game day (If red on the next game day, wear navy jersey to practice). Soccer.com Customer Service: 1-800-950-1994, custserv@sportsendeavors.com. Link to order uniform kit: RECREATIONAL U11+ (Click or select "U11+") – However, do not order your uniform until BSC has rostered your player to a team and assigned a uniform number. Jerseys will be numbered. BSC will roster registered players and assign a uniform number. Do not order your uniform until BSC has assigned your player a uniform number. All other bullet points above for U4 – U10 Recreational Uniforms apply to U11+ Recreational Uniforms.